The Tampa Bay Rays will get left-hander Matt Moore back on Sept 3 with a start against the Los Angels Angels according to Marc Topkin of the Tampa Bay Times. 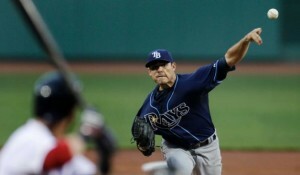 Moore was 14-3 with a 3.41 ERA before Tampa Bay put him on the disabled list July 31 with a tender elbow. Moore threw 49 pitches in a simulated game on Sunday and pronounced himself ready.He said Sunday, according to the Tampa Tribune, that he had felt the normal soreness he would after pitching in a regular game and would try to talk Maddon into letting him return this week. Tampa Bay enters Monday with a 74-54 record, one game behind the Boston Red Sox in the AL East. The Rays are tied with the Athletics for first place in the AL Wild Card, but the Indians, Orioles and Yankees are all within 3 1/2 games of the leaders.